The Horseshoe Mountain Trail in Lake Catherine State Park Arkansas is one of my favorite places to hike. The trail winds through a wonderful variety of peaceful landscapes. Each season provides hikers with different points of interest and diverse wildlife. My hike begins in a beautiful Pine Forest zigzagging up the side of Horseshoe Mountain. Two Swallowtail Butterflies dance lightly across a Red Buckeye Bush illuminated by stray rays of sunlight. Soon the Pine Forest is interspersed with broadleaf Trees as the trail hugs a large outcropping of Rocks. Winding higher up the mountain I pick my way through boulders and sparse Trees in a constant climb toward the first plateau. Large Rocks and Pine Trees give way to a spectacular Deciduous Forest decorated with colorful Wildflowers. The trail make me feel as if I am moving through a vast cottage garden . The natural flow of the path is lined by Rocks, Grasses, Wildflowers and newly leafing Trees. Tiny birds move rapidly among the Leaves of the spring canopy stopping only to feast on the plentiful insects. An old log on my right is a launching platform for a swarm of white-winged termites. In the early morning light their translucent wings glow as they lift off drifting on a light breeze. For a moment I pause and imagine them to be woodland fairies launching themselves into the beautiful spring Forest. At the top of Horseshoe Mountain (782 feet) the trail traverses a ridge through the thinning Forest. A Yellow-Bellied Sapsucker is hopping from Tree to Tree searching for its breakfast. His red head markings are spectacular against the greenery surrounding us. Large clusters of Rose Verbena are growing from the edges of Rocks that create a series of obstacles on the trail. Yellow winged Grasshoppers spring forth with every step creating an illusion of flying Wildflowers. Lizards scramble under the Leaves as my footfall disrupts their basking in the sunlight. The trail leads me down into a predominantly Pine Forest dotted with spectacular blooming white Dogwood Trees. A tiny Black and White Warbler peers cautiously at me as I pass beneath its hiding place in the leaves above. When I reach the bottom of the trail it intersects with the Falls Branch Trail then continues up the other side of Horseshoe Mountain. On the top of the next ridge Deciduous Trees give way to a meadow sprinkled with Spiderwort, Wood Spurge, Birds Foot Violets, Rose Verbena and Potato Dandelions. In another month the dominant green ground cover will give way to a blanket of purple, pink, yellow and white. An opening in the foliage at the end of the ridge affords a view of both Lake Catherine below and Dam Mountain to the right. It is a perfect place to pause and reflect on the beauty Nature has painted for me today. The trail rapidly descends toward the Lake through a forest floor blanketed by years of rust autumn leaves. Beautiful Red Buckeye Bushes dot the side of the mountain drawing me toward the shoreline. A sweet Chickadee sings a soulful serenade and glances shyly at me from a branch winding across the trail. I continue on the path crossing both a suspension and small wood bridge that leading me past nearby lake front campsites. A short while later I reach the trail head from which I began my hike. 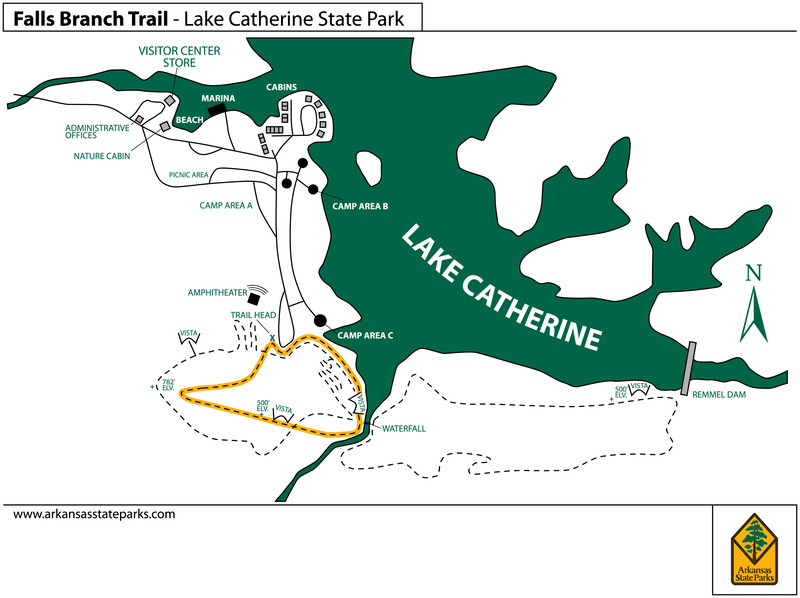 Lake Catherine State Park’s Falls Branch Trail provides a lovely hike with varied terrain, bridges and water features. Although it is shorter than the other park trails it offers hikers of all levels a wonderful Nature experience. There are three wood benches and several rocks along the journey for those wishing to take a leisurely pace. This trail like all others within the park is well marked and makes a loop leading you back to the trail head. Free parking is available for day hikers. The trail begins with a series of bridges crossing over a narrow winding creek. These well maintained wooden structures add variety to the hike along this mostly flat section of the trail. Lovely wildflowers add color on the banks of the slow moving water. Purple violets, pink oxalis and yellow goldenrod create a beautiful spring bouquet. Old stone steps lead upward from the final bridge to a winding path traveling through a mixed tree forest and rock accented landscape. Bird songs echo softly from the increasing spring canopy. Beautiful white blossoming Dogwoods glow among the illuminated green Leaves. Soon after a moderate climb the trail leads downward to a wider creek that separates Horseshoe and Dam Mountains. The collecting pools of water created by the rocky creek bed reflect the bright new green of spring opening above them. Waterfalls increase in size as you hike further down the trail. Each plateau is reached by traversing a cluster of stone steps built early in the 1900s. When you reach the top of the main waterfall the trail head of the Dam Mountain Trail located on the other side of the creek is visible. The main waterfall cascades into a clear pool below that is a popular spot for hikers to rest and cool their feet. Several families arrived after a hike on the Dam Mountain Trail and were enjoying a chance to wade in the water. Further down the trail I spotted a *Banded Water Snake swimming in the Lake Catherine. I watched as it floated, dove and swam at the shoreline. As I finished taking a few photographs I heard screaming up at the falls. The only word I could make out was “SNAKE” followed by frantic splashing and additional yelling. Please note if you are hiking for the first time in the Banded water Snake is a non-venomous Snake that loves the water. Although snake bites are rare in the park take care when you wade or swim as they are territorial and will strike if you don’t move away. The final leg of my hike along the Falls Branch Trail is along the edge of Lake Catherine. The murky blue green water sparkles in the sunlight and is still easily viewed through the early spring foliage. Butterflies and dragonflies weave in and out of the flowering bushes feeding on nectar in afternoon sun. 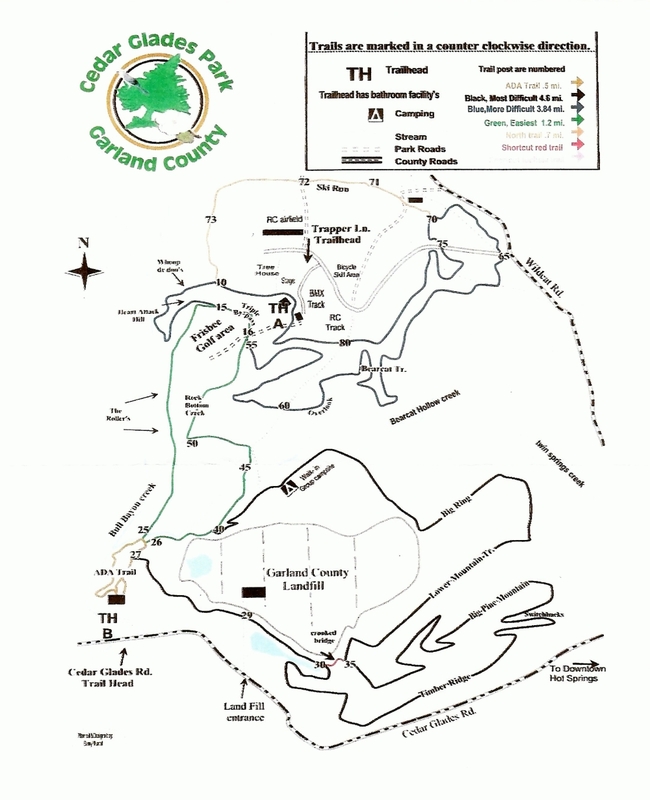 As you pass the lake shore campground you will cross the last creek on a suspension bridge. Several minutes later I reach the trail head, it has been a glorious time in the park. *originally identified as a Cottonmouth I was later informed (2015) this is a Banded water Snake. This is not a full on mountain hike, it is instead a peasant hill and dale terrain. I would highly recommend hiking boots as the blue trail is narrow, rocky with continuous exposed roots. The free flowing streams have both man-made and rock bridges for all weather condition crossings. Also be aware there are no benches for those wishing to sit and rest along the trail. The Trees were alive with song during our hike, but we did not catch sight of any birds. I believe the mountain bike usage may have made them wary of coming close to the trail edges. Butterflies, Lizards and Hummingbird Moths were abundant throughout our hike. As the weather heats up areas around springs should become a great place to spot turtles, snakes and frogs as well. Next time we will go a bit earlier in the morning as the trails numerous natural springs likely attract larger wildlife as well. In late April or early May when all the Trees are in full leaf it should be like hiking in a mini rain forest. Please note this is a multipurpose park and some areas will be noisier than others. This said once we were on the back side of the blue trail we heard only sounds of Nature. For a family seeking a variety of activities there is a rock wall, Frisbee golf, hiking, biking even a hike-in campsite. Clean modern bathrooms are available at both entrances/trail heads. This is a great road trip stopping point for outdoor enthusiasts of all ages or a fun FREE use day trip. Okay I have been a bit stir crazy for the past few days trapped inside by a string of storms. When I went to bed last night the weather prediction indicated two more days of rain with possibility of lightning. When I woke up this morning it seemed so light out I thought my watch had stopped. No, I had not slept in. While I was sleeping the clouds had parted and there was a hint of a blue sky. The new green was shimmering across the mountains of Hot Spring National Park. In less than an hour I prepped my gear and was out the door to hike in the emerging Rainforest. White Dogwood blooms and pink Red Bud blossoms glowed in the early morning light as I headed up into the park. I was surprised the delicate petals had survived 3 days of heavy rain and wind. Part way up the mountain I stopped to enjoy the sunrise with a crowd that was gathered at the Dead Chief Trail. The glorious winged group included Cedar Waxwings and Cardinals. Each took a turn at summoning the light with songs to entice the sun over the top of Hot Springs Mountain. As I hiked up to the top new growth was gently encasing me in a trail funnel of green. Beautiful rain battered wildflowers dotted the edges in purple, pink and yellow. Spectacular Swallowtail Butterflies flitted along the new green leaves and blossoms. It was a perfect morning in the Forest. Hot Springs National Park will be changed by a huge storm today. Heavy rains, wind and lightning will create both destruction and feed new life. Whenever we have an impending storm I Love to head into the park and see the delicate blossoms one more time. So breath in the beautiful dogwood sky and enjoy the Spring Beauty… more change is coming. PS Special Thanks to Denise Turon Casey for identifying Forsythia as the Yellow Blossoming Bush!